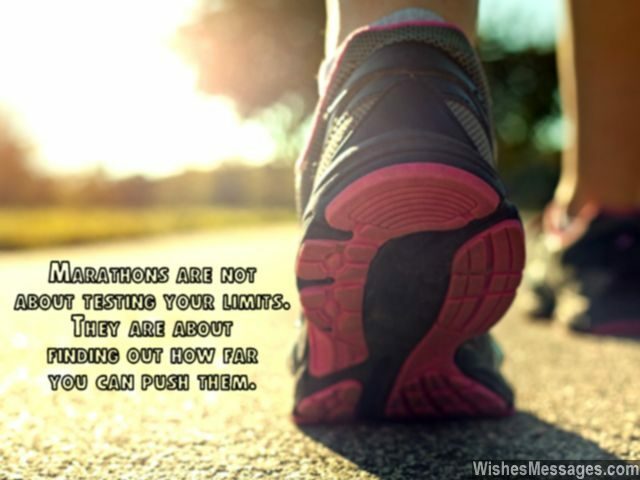 Inspirational Marathon Quotes: Know someone who’s training hard to run a marathon? Wish them good luck with inspirational quotes and motivational messages. Completing a marathon is a test of physical strength and endurance but when runners hit the wall, it becomes a battle of mind over matter. This is the when runners needs to dig deep inside their hearts to search for that spark of energy that helps them ignore the pain. Whether it is your friend, colleague, brother, sister, mom, dad, boss, girlfriend, husband, boyfriend or wife – keep motivating them with timely dozes of encouragement during the lead up to the big day. Send them texts, share encouraging messages on Facebook and Pinterest. Your words will go on to become the psychological anchor that they hold on to, when the body gives up at mile 25 right before the finish line. 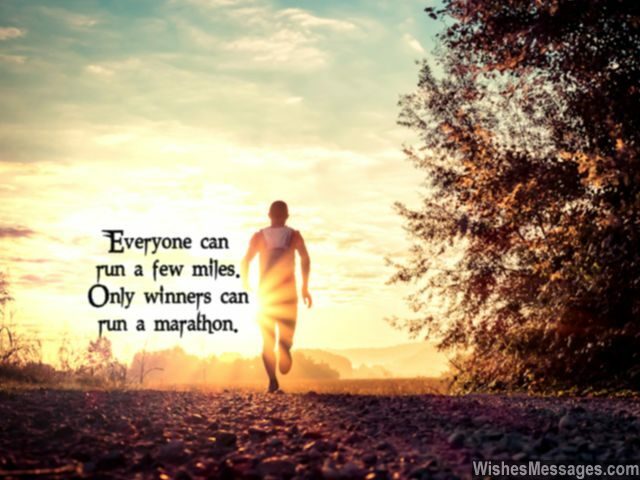 1) Everyone can run a few miles, only winners can run a marathon. 2) Marathon imitates life – never give up. Good luck. 3) The challenge of a marathon is such, that even the most successful people in the world start running marathons when they find life less challenging. 4) 100m races make superstars, marathons make legends. 5) You can train and prepare for a marathon all you want but when you hit the wall, it’s all mind over matter. 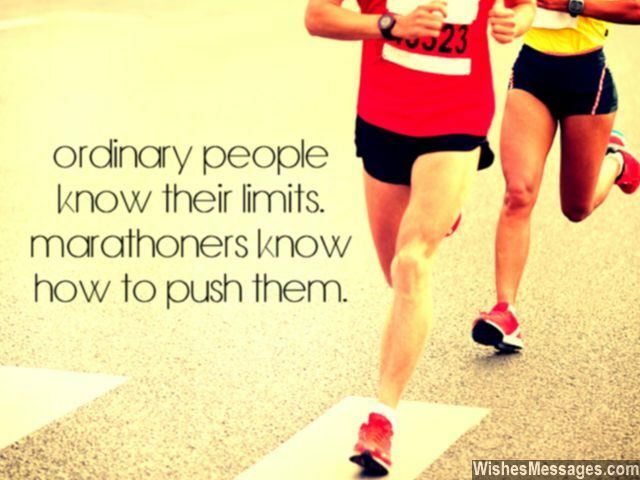 6) Ordinary people know their limits. Marathoners know how to push them. 7) The blisters in your legs will be temporary but the glory of being a marathon runner is permanent. 8) Just before the last few miles, you will feel like dying from the pain. But just after the finish line, you will feel like you’ve been born again. Good luck. 9) Marathon is a sport where you… don’t worry about your opponents, worry about the distance. Don’t worry about speed, worry about endurance. 10) Think about each and every time someone has called you a loser. Now channel all that frustration, bottle it up and unleash it at mile 20 to push yourself all the way to the finish line. 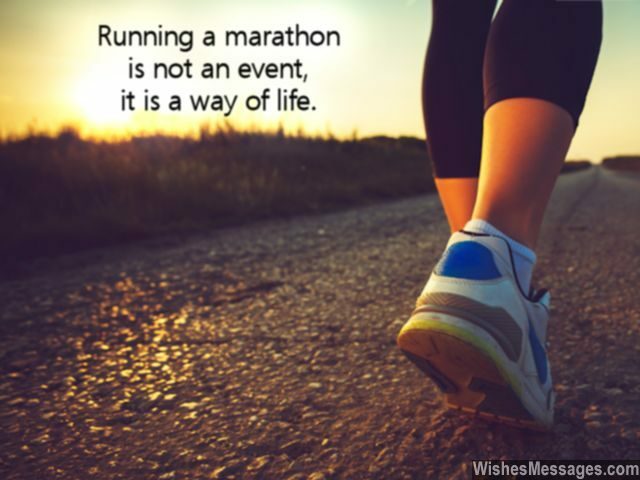 11) Running a marathon is not an event, it is a way of life. 12) The trick to running a marathon successfully is the convert the Fear of stopping halfway into the Hope of going all the way. 13) A marathon is less a test of your physical strength and more a test of your will power. 14) A 100m race is all about how fast you can spend energy. A marathon is all about how well you can save it until you need it the most. Good luck. 15) For a marathon, you can plan and strategize all you want but when your legs give away with a mile left to the finish line, there is just one thing you need to remember – RUN AS IF YOUR LIFE DEPENDS ON IT. 16) No matter how hard you train, if you don’t believe that you can finish, you never will. 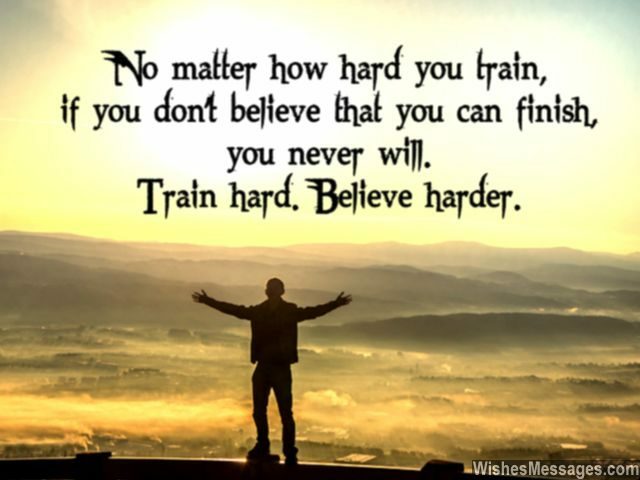 Train hard, believe harder. 17) Running marathons is not something you train for temporarily. It is a lifestyle and a school of thought. 18) A marathon is not about winning, it is about completing. A marathon is not about rapid gains, it is about ability to endure pain. A marathon is not about the thrill, it is about stamina and skill. 19) Just remember – if you think that you are running slower than you should, then you are running at the right pace. Good luck. 20) Training for a marathon can be your worst nightmare. But if you pull through, the rewards will be your sweetest dream come true. 21) Marathons are not about testing your limits. They are about finding out how far you can push them. 22) The later stages of a marathon are an ugly fight between your mind and your body. Your mind will keep telling the body to run, while the body will start to give up. They will keep fighting until neither have the energy to fight any longer. This is when your heart must step in and convince both your mind and your body to keep going. 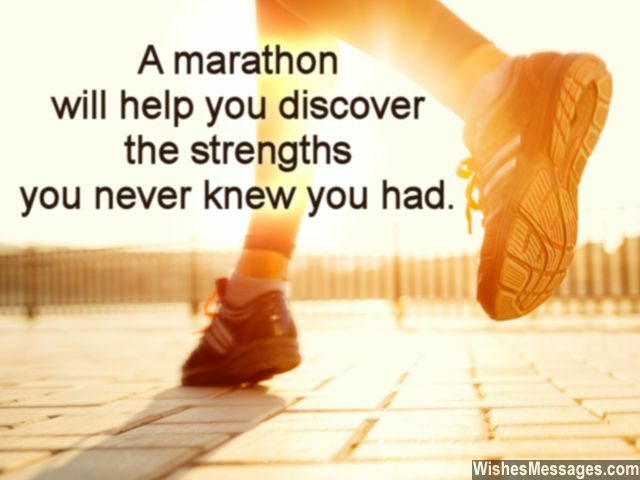 That’s exactly why, marathon runners have strong bodies, stronger minds and the strongest of hearts. 23) Running a marathon? Don’t let adrenalin get the better of you at the starting line. You’ll need heaps of it later. Good luck. 24) A marathon isn’t a test of excellence, it is a test of endurance. 25) Don’t believe in rebirth? You will, after your marathon. You will feel reborn the minute you cross that elusive finish line. 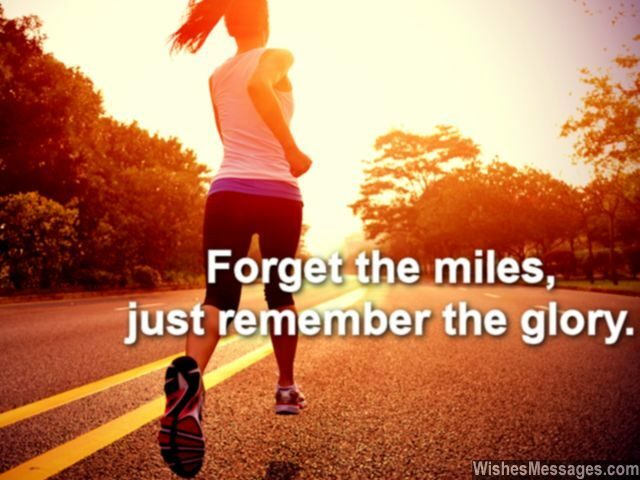 26) Forget the miles, just remember the glory. Good luck. 27) Train hard, run like there’s no tomorrow – success awaits you at the finish line. 28) Run a marathon, you will unlock the true meanings of FOCUS and ENDURANCE. 29) Running a marathon successfully is 0.5% Training, 0.5% Diet and 99% Determination. Go for it. 30) Complete that marathon – it will be the ultimate revenge against everyone who said you couldn’t do it. 31) A marathon is an event where everyone is equal and ordinary at the starting line and a legend is born at the finish line. 32) Marathon is the secret acronym for Motivation Ambition Redemption Aspiration Tactful Heroic Optimism and Never-give-up. 33) Men run 100m races, beasts run marathon… bring out the beast within. Good luck. 34) Forget all the advice that anyone has ever given you. Just remember one thing – you can do it. 35) Nobody became great overnight. Different people have different ways to get there but one thing that they all have in common is that they START. 36) A marathon will help you discover the strengths you never knew you had. Go for it. 37) If you learn how to really enjoy a marathon, you will never stop halfway. 38) Marathon is a funny race. You will feel Strong at the starting line. You will feel Weak at mile 15. You will feel Pathetic at mile 20. You will feel Dead at mile 23. But at mile 26.2, you’ll feel the Strongest. 39) Run a marathon as if your entire life depends on it – and you will never stop before the finish line. Good luck. 40) The essence of an ordinary race revolves around finding out How Fast Can You Run. 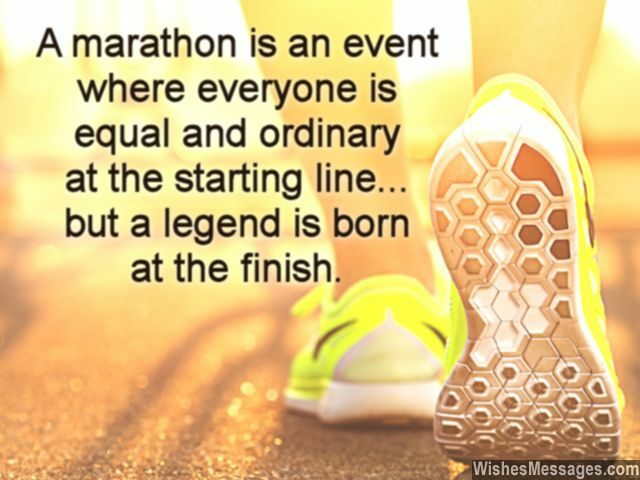 But the essence of a marathon lies in realizing How Much Can You Endure.